Want the Best Patio-Worthy, Ambrosia Apple Cocktails? It’s finally patio season and that means getting together with friends and enjoying some cheer. Why not do it in true Okanagan fashion with these cocktails (and one mocktail) featuring BC-born Ambrosia apples? 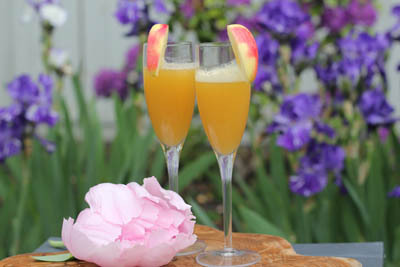 The key to making the best patio-worthy Ambrosia apple cocktails is to use freshly pressed juice made from fresh, raw Ambrosia apples. If you don’t have a juicer, check out this blog on how to make fresh juice without a juicer. Now, let’s get to the cocktail recipes. This recipe follows the classic French mimosa recipe but with fresh Ambrosia juice and, we suggest, a local sparkling wine. We use Cipes Brut from Summerhill Winery but there are plenty to chose from in the Okanagan! Pour apple juice into a Champagne flute, top with sparkling wine. Garnish with a slice of Ambrosia apple. Traditionally served at brunch, these are also very refreshing in the afternoon on a patio. You can even make them by the pitcher if you’ve got a large group. The Pimms Cup is a favourite summertime drink in the UK and we’ve added a little Canadian flare with this recipe. 1/4 of an Ambrosia apple, cubed (frozen apple chunks help to keep the drink cool without diluting it). Fill a tall glass with fruit and ice. Feel free to muddle the fruit a little if you want to get the flavour out. Pour in the Pimms, apple juice and top with ginger beer. Garnish with a mint sprig. Sangria is typically made with red wine but this recipe goes with white wine and a little hard apple cider. This recipe is best made by the pitcher ahead of time so that the fruit has a chance to marinate a bit in the liquid. Put everything except the cider in a pitcher and place in the refrigerator for 15 – 30 minutes to allow flavours to marry. When you’re ready to serve, add the apple cider and serve in large wine glasses with ice. This is one we borrowed from the Cocktail Builder website. It’s an easy summer sipper that is surprisingly smooth. Put everything into a cocktail shaker and stir. Strain and pour into a short tumbler filled with ice. Here’s a non-alcoholic option that’s great for kids, the designated driver, or anyone who doesn’t want the alcohol. Put ice in a large tumbler. Pour apple juice over ice, add Kombucha and gently stir (not too vigourously or you’ll lose the natural carbonation of the Kombucha) and garnish with a lemon wedge. If your Kombucha is lacking in effervescence, you can top this drink off with ginger ale or sparkling water. Give these recipes a try and you’ll discover that Ambrosia apple juice is a refreshing and versatile addition to your summer cocktail repertoire. Cheers!